We had much to learn during our time in the Balkan nation of Macedonia, and if we can give you any advice before travelling here, it would be to understand the dispute about the country’s name! Did you know that there are many conflicting opinions between whether the country is called Macedonia, or FYROM (Former Yugoslav Republic of Macedonia)? We aren’t going to get into that argument in this post, but you can read about it in this article. Once you’ve got that main issue sorted out (or as sorted out as possible), you’ll be ready for Macedonia and its eclectic capital city of Skopje. When travelling, we tend to compare places to one another, we can’t help it, we just do. 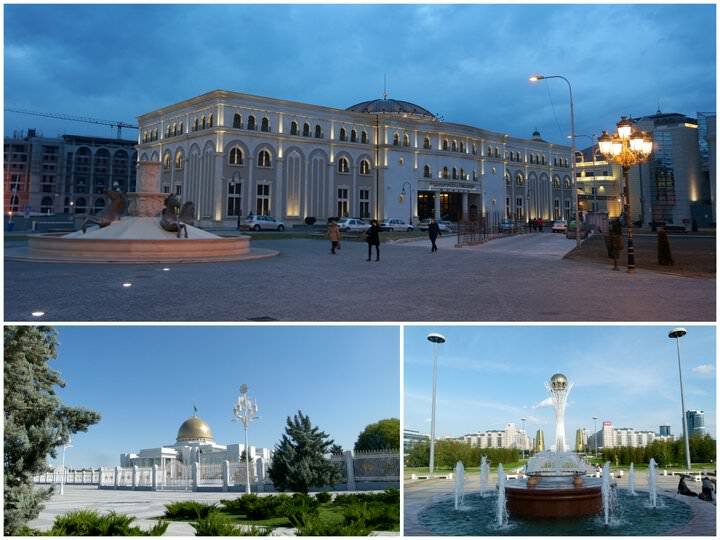 If we had to compare Skopje with a city from our previous travels, it would be either Ashgabat, Turkmenistan or Astana, Kazakstan. All of which have undergone major renovations, with grand, somewhat out-of-place architecture dotting the city centers. In recent years, an expensive and kitschy development in the city center has left many locals unimpressed, and questioning their Government’s choices in spending their tax dollars – which, according to this article, is around 300 million euros. The locals we spoke to want jobs, not enormous fountains, and statues! However, on the flip side of the argument, more tourists are now coming to Skopje as the city has done away with most of its drab soviet-style architecture, and is trying to identify itself as an exciting European destination. The influx in tourism could lead to more dollars in the pockets of the locals – at least for those in the tourism industry. 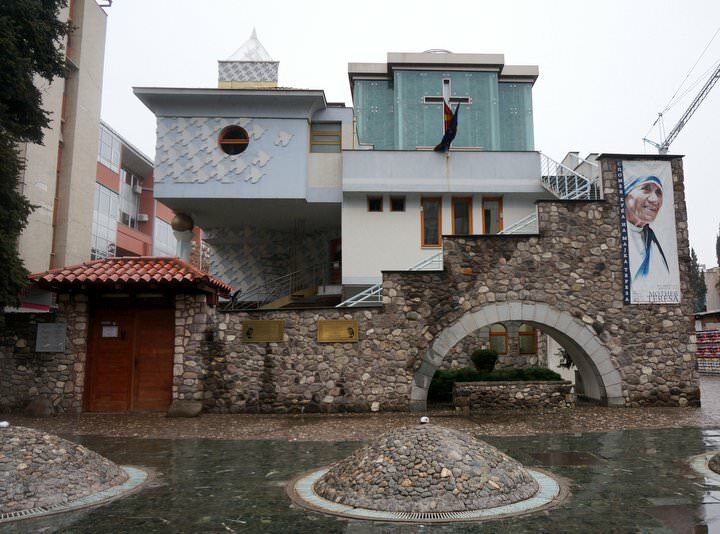 The Memorial House of Mother Teresa – did you know she was born in Skopje?! 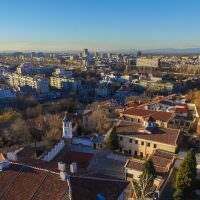 We arrived early in the day after an easy bus ride from Sofia, Bulgaria, and took a taxi to our hostel, Hi Skopje. There are a few budget places to stay in the city, but we opted for this hostel due to its positive reviews, and appealing online photos. 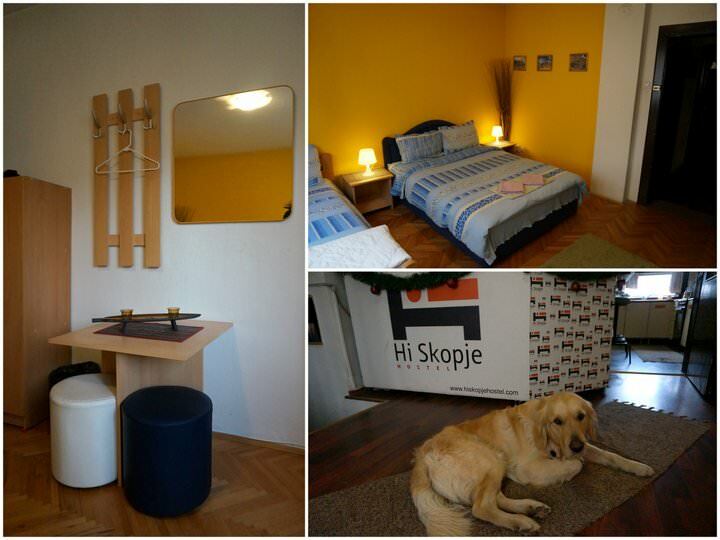 Our room at Hi Skopje Hostel…and Zhile the dog! 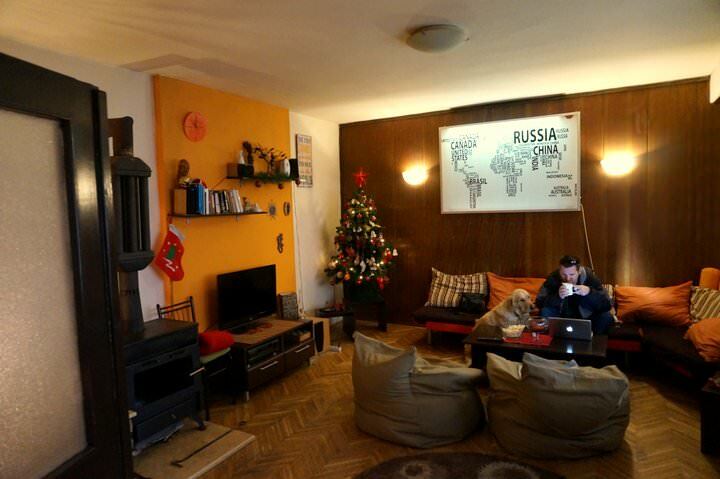 For us, a hostel must have a cozy, comfortable communal area, which this place definitely had. The fireplace was on when we arrived, and our room was pre-heated (thankfully!). We met with Marina, who is one of the owners and is a fellow traveller. Her and a friend decided to open up the hostel when they were in their early 20’s! Pretty impressive. The hostel and each of the rooms were decorated with all things travel, accumulated from various destinations around the world. Our room had a very comfortable bed and had some nice furniture in the room, which is always a bonus. Immediately we could relate to Marina, and because she is a traveller, this meant that she knew what backpackers look for in a hostel – fast wi-fi, communal feel, kitchen, laundry, breakfast, and clean rooms. As an added bonus, this place came with Zhile, the adorable Golden Retriever. 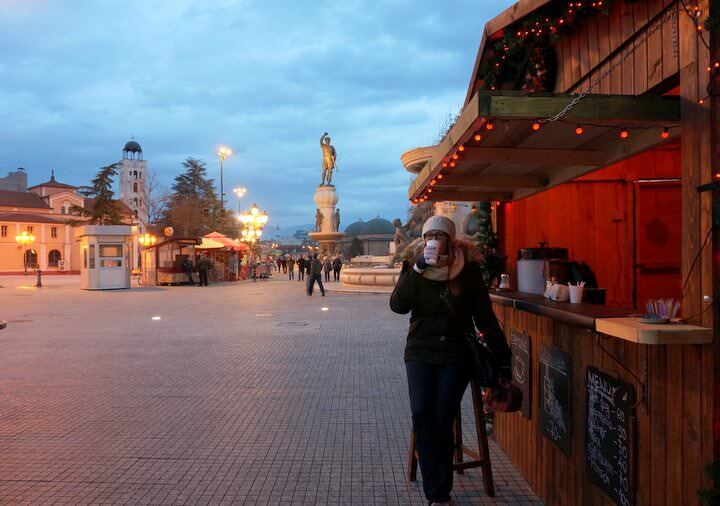 After unloading our packs into our room, and having a quick cup of coffee, we were off to explore Skopje. The city can basically be split into two parts: on one side of the Vardar river, there’s the modern, newly developed area, while crossing the bridge to the north will bring you to the old, ottoman-era bazaar and neighbourhood. 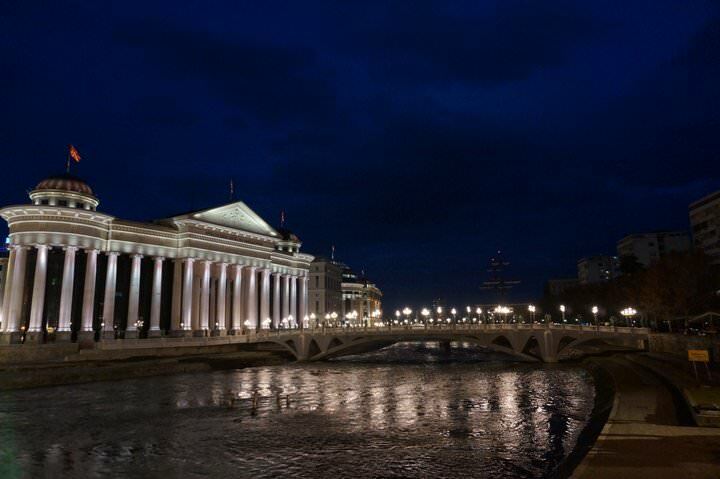 An easy, 5 minute taxi ride brought us to the center of the city – Skopje’s masterpiece. We entered through the Mother Theresa gate and into the pedestrian-only area, complete with a 22 meter high statue of Alexander The Great riding a horse. Surrounding the towering statue were lanes leading out from this center point, which were lined with shops and busy restaurants. Since we were visiting in January, Christmas lights were still strung up on the lanterns and buildings, which really made for a nice winter setting. The ground we were walking on was marble. And although it looked nice, it was impractical as it became very slippery when it snowed and rained! Looking across the Vardar River we spotted more buildings, including the Museum of Macedonia and the Opera House. Crossing the beautiful 15th century stone bridge brought us to the start of the Old Bazaar …which is where we found hot wine! There was an Austrian project that was set up for the winter, which offered hot wine and rum to passersby, for a mere $1.25. Hot wine is my new favourite winter drink! The Old Bazaar and Ottoman neighbourhood is an excellent spot for wandering around through the cobblestone streets, while popping in at various restaurants to sample the local dishes of Tavče gravče (spiced beans in clay earthenware) and burek (meat & veggie stuffed pastry) along the way. 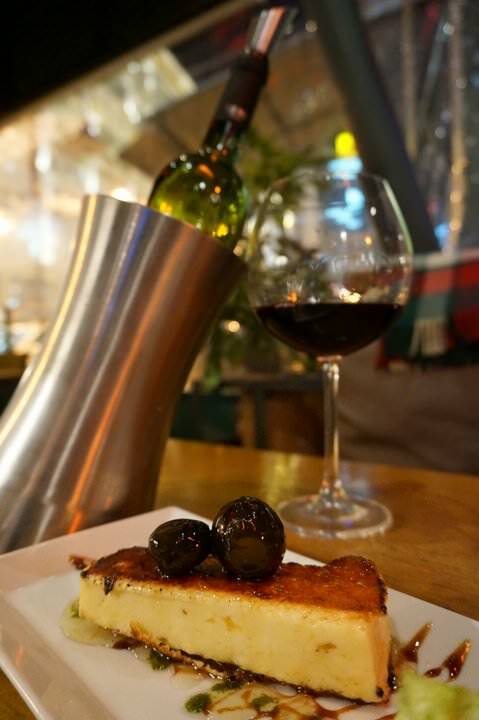 We found numerous wine bars here, plus a local brewery with live music in the evenings. In fact, Skopje had some delicious food, which was a welcomed surprise! Apart from food, wine and entertainment, the Ottoman area is home to mosques, churches, galleries and museums, plus the second oldest bazaar in the Balkans (next to the one in Istanbul). Oh ya, the restaurants in Skopje were awesome! In the actual bazaar itself we found vendors selling anything and everything we could want or need. Which was good as we were actually in the market for a scarf, mitts and a toque for Nick. Towering above the old bazaar is the Tvrdina Fort, which was built in the 6th century AD. The views over the city from the fortress were excellent, and even though it was very windy and cold the day we went, we still enjoyed it. After three days of eating, drinking and sightseeing in Skopje, it was time for us to move on. We picked up our rental car and made our way southwest to the tourist hotspot of Lake Ohrid. Stay tuned to hear about what we got up to there, including an incredible festival…and epic videos! Watch out for the corrupt taxi drivers in Skopje. 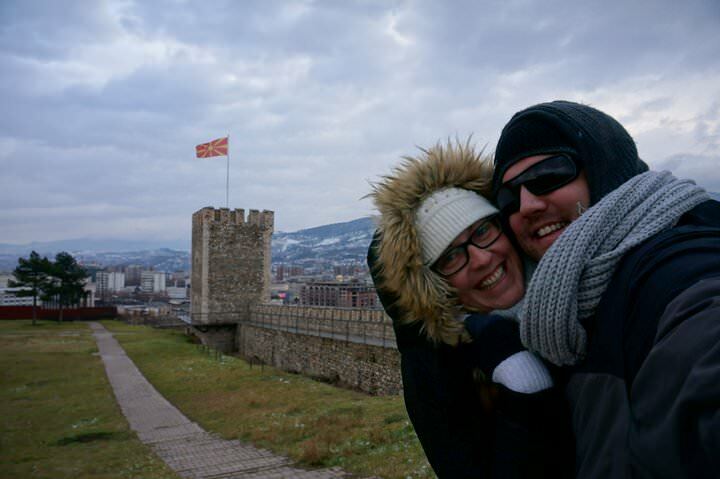 We had a 50/50 experience with honest vs. scammers during our stay in Skopje. Some of them have “special” meters, which count the fare much faster than normal. Find out what the price should be before setting off. A taxi from Hi Skopje Hostel to the bus station, is around 100 – 150 MKD, and from the hostel to the city center, it’s around 100 MKD. Walking is around 15 minutes to the center. 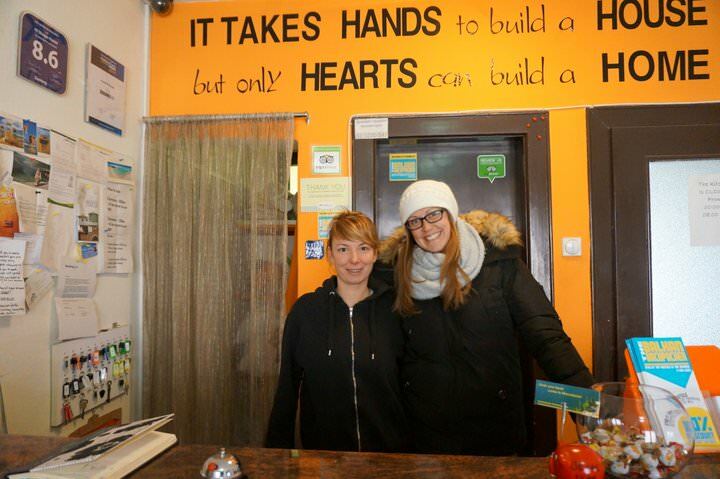 We had an awesome stay at the Hi Skopje Hostel. The room was clean, comfy and the pooch was an added bonus! You can book your room at the hostel here. 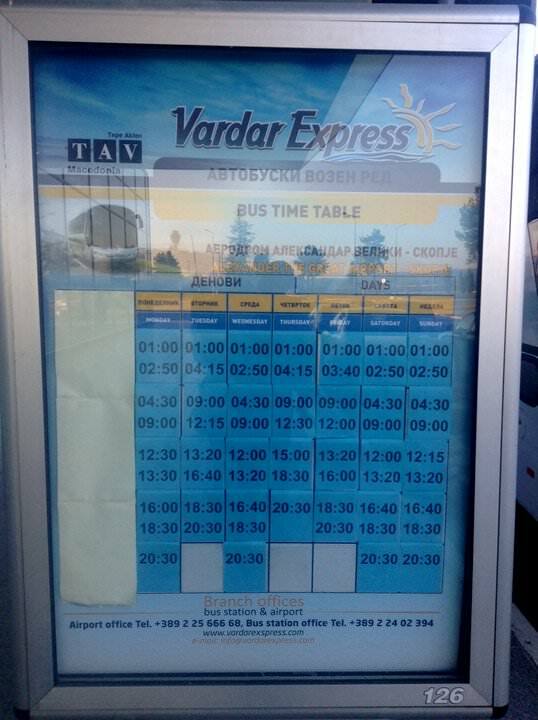 From the airport, there is a shuttle bus with Vardar Express that will take you to the center, or to the bus / train station. This costs 175 MKD and takes around 30 minutes. A taxi will run you 20 euros or more. You can see the bus schedule below. Not the best photo! But this is the schedule from the airport into town. A huge thank you to Marina for hosting us at her hostel during our stay…and for having our backs and telling off the taxi driver when he tried to rip us off! As always, all thoughts, opinions and reviews remain our own – despite any complimentary services received. I hope that the influx of tourist attractions being constructed here and there in Skopje also brings more local jobs. PS: Hot wine for the win! On my recent EuroTrip, I went gaga over hot red wine in Vienna! Tastes like heaven but costs dirt cheap! Ooooh that food looks good! I’m all for the architecture as well. Let’s hope the government’s decision to pump so much money into it pays off for the locals. I really hope it does. Your tips at the end are really useful too: thanks for the heads up about those taxi monkeys! Looks like a very fun time! That cheese dish looks amazing. I would love to see the statue of Alexander the Great and the blue lights in the Old Bazaar were so photogenic. 😉 Thanks, I did not know anything at all about Macedonia until now. Thanks for reading Melody! Maybe now Macedonia is on your travel list?? Thanks so much for this very thorough post! 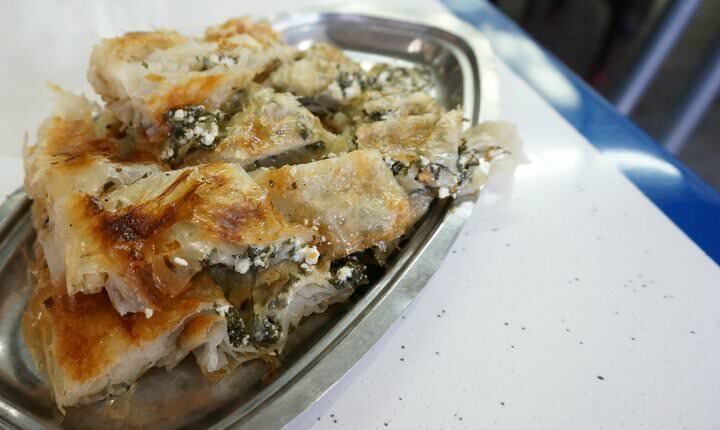 This is not an area of the world that I know much about at all, but for that reason, it’s definitely on my very long list of destinations to hit up over the next few years (And that burek looks amazing!). 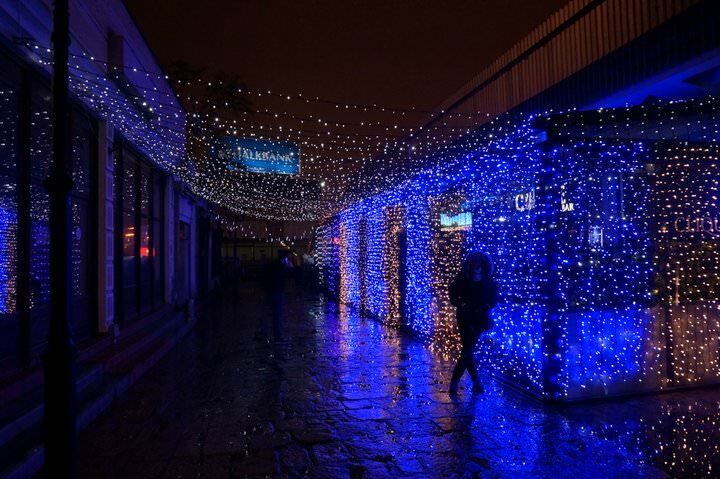 Loving the blue lights at the old bazaar and the hot wine and the dog! 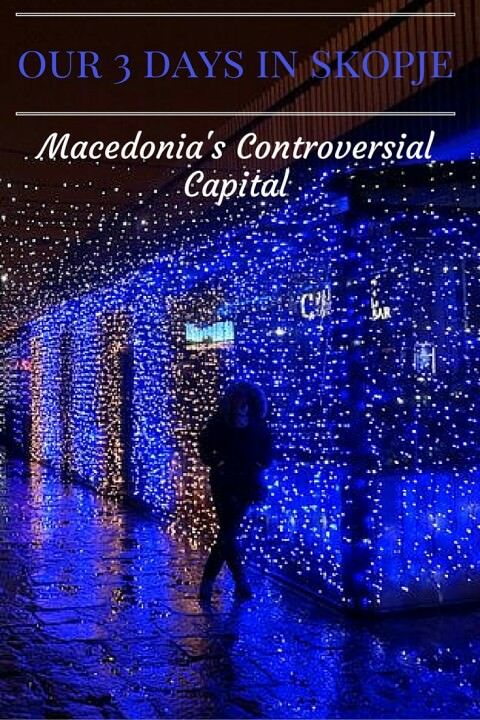 Macedonia dn the capital seem to be making a come back, watch out in a couple of years! The dog was adorable 🙂 Yes! Skopje seems to be doing well, more tourists now. That hostel looks really nice. I love the fact that they had a dog – missing my dogs is my only complaint about traveling. I have never traveled in that part of the world although Greg has. The contrast between old and drab vs. new and glitzy must really be interesting. I think I’d almost prefer the old and drab! For us, we don’t have a permanent dog, but we get to housesit and enjoy furry company from time to time 🙂 I like the old and the new, I find the contrast very interesting! Thanks for the comment. haha, Ya, when have you ever had a hostel owner have your back like that? It was pretty cool! I really appreciate the honest tips at the end – there’s nothing worse than being scammed, especially on vacation! Gotta watch those taxis! Why is it that everyone has a taxi story?! Macedonia is great year-round, depending on what you want to do there. We went skiing, so it was OK that there was snow – but walking around was a bit cold! I love traveling to ancient places, learning the food culture, trying the local cuisines, etc. as it helps me to get inspiration for my new dishes. I have heard about Skopje from my friend, but I was not aware about the delicious food and restaurants. Loved reading your travel experience and thank you for sharing this information. Great post! Thanks for reading 🙂 The food was really good! Cheers. I went t Skopje last year, it was such a weird city! Feels like a them park kind of with all the statues everywhere. People wouldn’t think it was so amusing if it was western France ridiculously claiming to be “Republic of England” and using that claim to proclaim 1/3 of the UK as “modern British occupied England”. Names aren’t just names. Calling them Macedonians is incredibly offensive to Greeks. You are taking a side. The friend of my enemy is becomes my enemy. I wish that was not the case but you all spit on Greeks by trying to ethnic engineer obvious Slavs into “macedonians”. Oh, so cool! I am going to Skopje in a bit more than one month and already started planning a bit. It actually looks much more pretty (on pictures) than I would have thought before I started researching. Thanks for this great article! I’m visiting Skopje in February. I will try that restaurant and I hope to find some great coffee too!